A giveaway? On this blog? Whaaa– How is that even possible? Well you know…it’s almost valentine’s day. Can this be our box of chocolates for you? I guess it is. Haha. 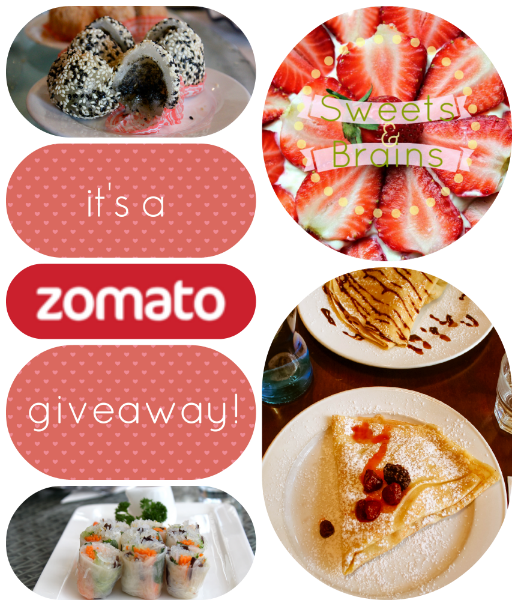 Thanks to the folks at Zomato, we’re having our first ever giveaway. Zomato is an online restaurant discovery guide. If you find yourself hungry in a random space here in Auckland (or the other many cities and countries Zomato is in), go on Zomato and it’ll show you the food places around, with all the details and reviews. It’s also a cool sort of social networking site for foodies – for people like you and me. Lookie here…it’s my Zomato account. I write reviews. Weee..
Don’t worry this is an open-book exam. Go onto our Zomato profile and check our reviews for the answer. Signing onto Zomato is pretty easy too, you can use your email or connect your facebook account. Go and follow us 😀 After you’ve done all that you can earn extra entries by liking us on facebook or tweeting our giveaway. Yay!